The Junior League of Omaha is known for its ability to train volunteers. We involve and engage our members in a variety of volunteer service, skill building and networking opportunities. Membership is open to all women, at least 21 years old, who are committed to voluntarism. The Junior League of Omaha reaches out to women of all races, religions and origins. Each membership year begins June 1 and ends May 30. Informational sessions for our 2019-2020 class can be found below. Follow us on Facebook, Twitter and Instagram for additional updates and opportunities! We are now accepting applications for the 2019-2020 101st New Member Class! Applications will be accepted until May 31, 2019. You are welcome and encouraged to attend any of the following information sessions to learn more about the Junior League of Omaha, our community efforts, opportunities for volunteer and leadership involvement and the benefits of membership. For questions on becoming a New Member and to RSVP for the info sessions – reach out to our Recruitment Coordinator, Heidi Hansen, at join@jlomaha.org. We can’t wait to meet you! ***You can also look for these info sessions as events on Facebook. Mark that you are going! 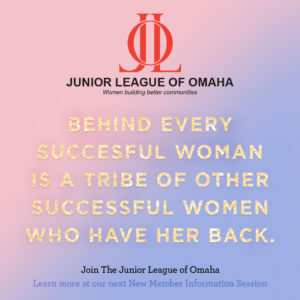 If you are unable to attend a New Member information session, but are still interested in becoming a member of the Junior League of Omaha, feel free to complete our online registration.